MONTEVIDEO. 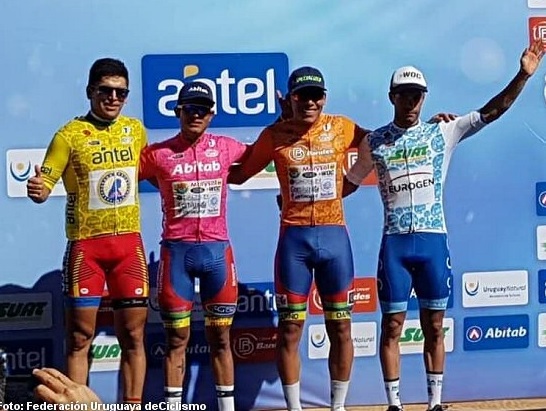 Argentinian cyclist Nicolás Naranjo (Virgen de Fátima) has donned the first leader’s jersey of the 76th edition of the Vuelta Ciclista del Uruguay after winning this first stage of 156 kilometers between Cuidad del Plata and Colonia. With a time of 3 hours, 35 minutes and 33 seconds, Naranjo won the sprint on arrival in Cologne, where he beat his compatriots Héctor Lucero (Municipality of Pocito) and Nicolás Tivani (Virgen De Fátima), second and third respectively. Pablo Anchieri (Carmelo) was fourth and leads among the Uruguayans. Bruno Santa Cruz (Ciudad del Plata) commands in the U23 category and Fernando Méndez is the leader of the sprints. Before the arrival, Fernando Méndez and Walter González escaped for almost 45 kilometers, until they were reached by the continental teams that were looking for the stage. TEN FIRST CLASSIFICATION STAGE 1 (156 KM).